Figure 3 Structure of JAKs. The JAK family of kinases contains seven conserved sequence regions, JAK homol-ogy (JH) domains 1 to 7. The JH1 domain is a tyrosine kinase domain, and the JH2 domain is a pseudokinase domain without catalytic activity but is essential for normal JAK function. The region encompassing the C-terminal portion of JH4 and the JH3 domain has sequence similarity with SH2 domains. The N-terminal region of JAKs contains a FERM domain, which is critical for their association with the receptor and for kinase function. Src homology 2 (SH2) domains, the modular phosphotyro-sine binding domains [21,22]. As with the FERM domain, the level of sequence similarity of the JAK SH2-like domain with other SH2 domains is very low, and to date the function of this domain in JAK kinases is not known. Certain mutant forms of JAK3 isolated from patients with severe combined immune deficiency (SCID) revealed point mutations in the FERM domain . 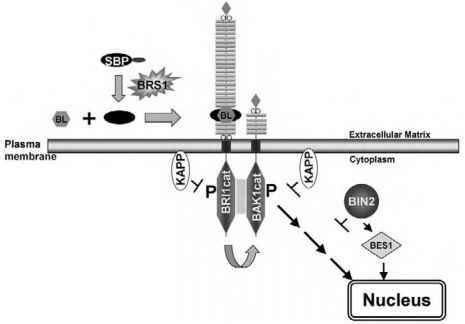 Interestingly, these mutations not only disrupted kinase-receptor association, but also abrogated adenosine triphosphate (ATP) binding to the kinase domain, thereby destroying kinase activity. The mutation Gly 341 to Glu that maps to the FERM domain of the Drosophila Hop protein (a JAK homolog) has been shown to hyperactivate the kinase . Furthermore, mutations in the pseudokinase domain of JAKs have been shown to alter the activity of the kinase, with different mutations resulting in either a loss of kinase activity  or a hyperactive kinase . These results suggest a complex interplay between the various domains of JAKs, an understanding of which will require a crystal structure of the entire JAK molecule.